MEI Editor's Blog: Ursula Lindsey on Egypt's "New Capital"
I think I've been fairly clear (see here and here) that I'm pretty dubious, if not downright cynical, about Egypt's "new administrative capital," the waterless, public-transportless city supposed to sprout in the desert east of Cairo, where greenery and high rises will allow the government to function in splendid isolation without poverty, congestion, or poor people. In the two years since this new Xanadu was announced, its original Emirati patrons have bailed out, as has one of its two Chinese corporate rescuers. I've quoted other doubters before, such as urban planner David Sims, and now we have a detailed, sustained indictment of this money pit/mirage from Ursula Lindsey, who lived in Cairo for years, including the revolutionary years, and is now living in Morocco. 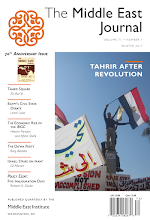 Her article, "The Anti-Cairo," the subtitle of which is "Egypt’s military regime is building a new capital city in the desert, where the “People’s Piazza” will be a pale shadow of Tahrir Square." If I recall correctly, both the Abbasid Empire and the Ummayad Empire did similar things when conditions became uncomfortably crowded and socio-economic-political tensions arose in their original capitals at Baghdad and Cordoba. In the end, withdrawing to a safer distance from the masses did not save either empire. Quite right. Baghdad itself was founded to escape Kufa, and both Raqqa and Samarra to escape Baghdad.